With Liverpool playing Utrecht at home tonight in the Europa League Liverpool manager Roy Hodgson had to sit in front of the press and answer questions. The press conference came the day after the new owners had done their live phone-in, with many callers asking why on earth Roy was still in charge at Anfield. 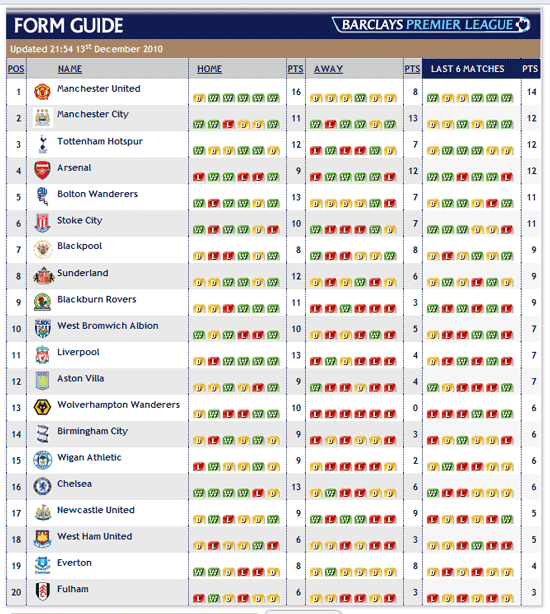 This was an interesting claim from Roy, but also one that was very easy to get checked out because the Premier League’s own website includes a recent form table based on results from the last six games. So was Roy correct, was it just “The Arsenal” and “maybe Manchester United” above Liverpool on recent form? Liverpool are in fact eleventh in that table. Ahead of Liverpool are the two Manchester sides, Spurs, Arsenal, Bolton, Stoke, Blackpool, Sunderland, Blackburn and West Brom. It’s difficult to understand how Roy feels he deserves any respect or trust when he makes such inaccurate claims in the hope of defending the awful start to his Anfield career. Liverpool are ninth in the full league table (and the team below them, Blackpool, have played a game less) and Roy is trying to suggest it was just a bad start that put the team there, and that the team is now much better. 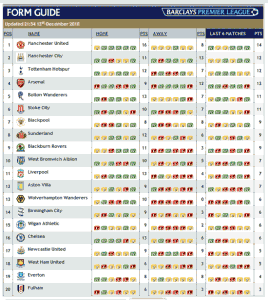 Yet on recent form, without any games-in-hand to confuse matters, Liverpool are even worse, in eleventh place. We aren’t “right up there”, we’re nowhere near. Either Roy knew this, and hoped he could pull the wool over the eyes of the fans, and over the eyes of the reporters who are based locally and don’t give him the easy ride he gets from his old friends elsewhere in the media – or he’s so out of touch with the situation that he thought his little claim was spot on. It’s a worry either way. Not that it’s his fault: “But of course there’s lot of reasons for it, you know, there are to some extent injury situations and also, more to the point you know, one or two of our so called star players, who are going to be the ones who bring us up to the levels, are still trying to find the form that they had in the past that will bring us there. Roy says the situation is about to improve: “I’m expecting the next games to go better, I’m expecting to see the team – if anything – climb the table, not to go back down the table.” He’s the manager of Liverpool Football Club; surely he should be giving supporters expectations better than maybe not dropping any further than ninth. He praised the owners before pointing out he has something in common with some of the supporters: “I’ve seen what the owners said, I think they spoke very, very well; considering it was a phone-in I think they did brilliantly well because certainly, like all English managers, the last programme any of us would ever think of even turning on is those phone-ins after matches.” Why single out English managers? Many people, many supporters, find post-match phone-ins are best avoided. With Sam Allardyce sacked yesterday by the new owners of Blackburn Roy was asked if he felt any concern for his own future, given Liverpool also have new owners. He shrugged his shoulders before having a little bite at the reporter: “Well, you know, you’re going down the happy route again, you know, ‘who can we get sacked next’, I suppose. He explained why: “The owners have made it perfectly clear and certainly they said yesterday they are in it for the long term and they are going to be patient, they realise it is going to take time. So far he’d blamed injuries, poor form of players and – presumably – the squad not having enough players like Konchesky and Poulsen for his liking. Any manager will defend himself in these situations, but Roy gives the impression that he’s right and that nobody can teach him anything about being a manager. A little admission now and again that he personally has made mistakes would have helped fans feel that he at least recognised his own shortcomings, because that would have meant he was able to at least try and do something about them. He went on to suggest that if he was sacked it wouldn’t be because of his own failure to come close meeting expectations: “If you mean to say, ‘Oh, so you feel there’s no chance whatsoever of you getting sacked,’ well then I’d be in a minority of one in that respect because it happens to Hughton, it happens to Allardyce, O’Neill resigns. So not only does he tell us that eleventh (on form) is “right up there”, or that he’s aiming to try and stop us going any lower than ninth in the league, but now he’s implying that there’s nothing else that can be done. The owners are telling fans they know the situation is unacceptable; Roy is telling fans to accept it, to get used to it. Liverpool Football Club needs a manager who cares, a manager who will fight, a manager who will motivate his players and understands what this club is about. Roy Hodgson is not that manager. Woy’s gone from being a figure of fun, to a real danger to the future of Liverpool FC. If the owners can’t see this then we’re sunk. Its sad to see a man cracking up because he is so out of his depth he is drowning! Hodgson should leave and save whatever sanity he has left, though judging from his latest statements it may be too late. What kind of evil people did this to him? ‘man who has done nothing but act with integrity and honesty’..? When told that two reporters where from Denmark and Sweden, Hodgson’s retort..
Yeah, integrity in it’s fullest that. @Tom Why don’t you take your head out of the sand? Integrity? Honesty? Intelligence? You are not graced with any of those things, clearly. And neither is Roy. Tom, (Darren from Thetford/Paddy Barclay/Roy) if you’re gonna back yourself, at least invent things we can believe. yours, every other liverpool fan. Tom the sooner the better he realises and you realise his CV didn’t warrant him the job the better. The man is a fraud and the integrity + honesty you refer too is non-existent. We’re 17 games into the season and still have a minus goal difference, he is using our best player as a Bobby Zamora type and not playing to Nando’s strengths. The man is out of his depth on the pitch and off it with the fans. He has no connection whatsoever the sooner the better he resigns or gets the sack and we get a manager who will unite the fanbase the better it will be for us as fans and the club on and off the pitch for Werner and Henry too. He tells us only Arsenal, maybe Man Utd, are above us on form from the last 5 or 6 games – yet we’ve got 10 sides above is. Is that a sign of honesty and integrity? And if it wasn’t deliberate, why come out with such a claim without at least checking it first? His whole reputation is based on little facts that often don’t stand up to any kind of scrutiny. Also, why do we have to wait two weeks before looking at whether he’s right or wrong for us? Agree with a lot of what’s being said, however I fully believe that the owners are looking for a new manager and don’t agree with the general anti NESV that is starting to bubble up. I don’t think Hodgson should be removed until that permanent long term replacement is found. He is 100% the wrong man for us, but let NESV replace him in an intelligent, planned manner. @Tom We don’t doubt that Roy is doing his best, its just that that is not good enough. Not only are his efforts not good enough, but he seems to think that there is no one else able to do it as well as him. Obviously no man would say there are better men to take his place, but to openly state that no one can do any better is not only arrogant, its foolish. There is no doubt that Roy is full of honesty and integrity, what he lacks is skill and ability. In addition, don’t turn yourself into a hypocrite by crticising people who are being honest and expressing their integrity, in the best way they see fit. if you don’t like “whinging reports” on a public webspace, then you can use your right as a user of said space and look away. @Alan, you remove cancer at the first available opportunity otherwise it becomes inoperable. Rafa won the CL with “someones’s team” but Roy has made “someone else’s” team even worse. Roy much better than Benitez? If Roy can get us 2nd in the league fair play to him. By the way, put Rafa’s medals on the table, then put Roy’s…you’ll see who was the better manager. Tom You would have been better off digesting what was written in the article, rather than criticizing its author. If you continue to appear so out of touch on the Hodgson managerial issue, then I am afraid that NESV may lose a lot of credibility with the majority of fans. At least 90% of the whole of the Liverpool fan base feels that Hodgson is not the right man for the job. Please find a manager worthy of representing this club and its fans. A positive manager with a winning mentality, one that we can all respect. Just for the avoidance of any doubt, the “Tom” above isn’t the same “Tom” who happens to be chairman of LFC. To be frank I’ve grown tired of Roy’s answers to the press. He clearly loves to use the same old excuses, and inserts his magic wand anecdote into it as well. It’s all too predictable. I think the owners know full well how we feel about Roy. I really do feel that currently they are debating whether Kenny Dalglish should be put in as an interim solution while they determine who should be the next manager. Once they have found the guy, I am confident they won’t hesitate to put him in charge. Guys, we have to be fair to Liverpool and to Roy. For both parties sake, remove Roy. He may be a nice guy but simply not the man for Liverpool. Roy just does not have what it takes to manage a team craving for titles. Sick of this nice guy tag with Roy, he’s not! He’s a arrogant chancer who insults his players in public, belittles other peoples opinions ignores the facts and tries to re-write the facts (as indicated this article) & blames all but himself. Neither is he a man of honesty or dignity,if he was,he would take a step back & have a look & admit the job is too big for him.That way, he could leave with some kind of credability. Your comments are little short of a disgrace. Yes, he’s not up to the standards of previous Liverpool managers but let’s remember he didn’t apply for the job. He was offered it by Christian Purslow. Who wouldn’t accept the job when a big club comes calling? Name me one manager who’s refused a job at a top four club? The owners aren’t stupid. They will act when they deem it right to do so. They know there is a danger of Torres and Reina leaving next summer if we don’t finish high enough. But a credible alternative has to be available. No point jumping from the frying pan into the fire. Look at the criticism the new Blackburn owners are under for their ridiculous decision to sack Alladyce. Would you want our owners to be similarly ridiculed? And I can’t stand “you people” who think Torres is disinterested and lacks confidence and we should keep Roy and sell one of the best strikers in the world. He’s got a shocking record of winning away and we’re not winning away. Duh! What part of that equation is too difficult for your tiny, Andy-Gray-inspired mind to understand? People, even “experts” such as Mark Lawrenson who perpetual the notion brandished about by Gerard Houllier himself that Benitez won the CL title with another manager’s team are shamefully displaying their stupidity. First and foremost, the team Houllier left behind weren’t exactly the “winning materials” to begin with. Almost every football pundits on the planet and their wives, had never given Liverpool a ghost of a chance of winning that CL title in 2005 even as late as the quarter-final stage. Not even the most ardent fans had foreseen it. Credit to Benitez for turning a half decent team into a CL-winning team. Beside, which were really the Houllier team? The player of the year then was Danny Murphy, a key player amongst the failures. He was gone. And so was Michael Owen whose goals Houllier relied upon heavily! So stop disgracing yourself, Stevie, for saying something as stupid as this in public. simple qns. if roy is gd and rafa is so bad, why is torres scoring less goals than last season? lack of interest? off-form? or plain disdain for the manager. if there was a lack of interest from torres, he wld have moved on in the summer. and for **** sake, rafa left us with no less than 13 internationals, at least 10 internationals who played the world cup. so wat has he bought? koncheshit, poulshit, brad jones, players who cant even start for their countries or previous clubs. poor deployment of joe cole, left mid?? cmon! meireles right mid (b4 gerrard gt injured) WTF! wat has he sold? riera!!! our best left footed player in the team. yossi benayoun, israeli captain who can play in no less than 4 positions in the team, loves to score hat tricks against lowly opposition. mascherano, granted, his wife wanted him to leave, but u din see that in previous seasons? aquilani! our next midfield player after gerrard! (replaced by poulshit) insua, granted, he cant defend well, but koncheshit defend? NO!! and one insua runs faster, crosses better than 10 koncheshit combined. IS ROY STILL BETTER THAN RAFA? OR IS HE EVEN SUITABLE FOR LIVERPOOL? You’re assuming that the owners know the situation as well as we do. I douby they do although they are probably learning fast. They’re professional enough not to react to fan’s demands. They will decide what to do when they’ve considered suitable replacements and that is unlikely to happen until a CEO has been apppointed. Those interviews take place tomorrow. Only then will the club have a person able to assist n the decision-making process which I’m sure the new CEO will. I’m pretty sure that unless the team start performing far better Roy’s days are numbered but things have to be done properly. No, Rafa never said those things but he did get criticised for the ‘rant’ last year. It was ill-judged although I personally agreed with much of what he said. I’m as frustrated as any other supporter and I’m certainly not a fan of Roy but when personal insults start flying that is not how our fans should behave. He can still be criticised but it shouldn’t include personal insults. I cannot for the life of me get all this “he destroyed everything” about Benitez. Could you be a little bit more specific about what Benitez is supposed to have “destroyed”?? I would have thought G+H fitted the bill if you wanted to make such an accusation.